My number one comfort food has to be noodles with soup. See, I’m clever, by declaring noodles in soup as my number one, I am able to cover a wide range of noodles. For example, chicken noodle soup, laksa, Penang Hokkien Mee, Kuey Teow Teng, Ipoh Hor Fun and so forth. Lately, I’ve been rather hooked on Japanese Ramen. Ever since Big Sis introduced me to Gumshara Ramen in Sydney, I’ve been trying to look for a similar ramen shop that serves similar quality and flavours in Melbourne. It’s been a long and hard search, made no less difficult by having to taste and eat a variety of noodles and ramen ( 😛 ) to ascertain the quality and authenticity of the product. One evening, a group of my food blogger buddies (I know I said I wouldn’t call them that anymore, and just call them friends, but it’s easier to describe them to you that way) decided to have ramen prior to our Karaoke night. Yes, these are my singing and eating buddies. We live by the hashtag of #foodbloggersrock. So anyway, back to the ramen we were going to have. I was extremely hungry that day, and it happened to be a relatively cool night (hence, it was making me hungrier). We had decided to drop by Ramen Ya for a quick bite to eat prior to our singing session. I placed an order for their ever popular Char Su Ramen in Tonkotsu broth. On the night that I had it, I found that the tonkotsu broth to be a bit on the watery side and wasn’t as sticky/thick as I’d like it to be. It wasn’t rich and as thick as the one I had in Gumshara Ramen. The char su however, was delightfully soft. Practically melted in my mouth. I’ve been here a few times after that session and have found that the consistency of the tonkotsu varies depending on how busy the kitchen gets. During peak hours (peak lunch times) it’s a lot thinner and not as thick, but during off-peak hours, it has a more wholesome taste to it. What do I think of the ramen in general? Despite the inconsistencies I’ve had with the broth, I am actually quite in love with this joint. It’s relatively near my work place, serves delicious hot noodle soup which I crave for and is authentic. Are there other places in Melbourne which serves better ramen and tonkotsu? 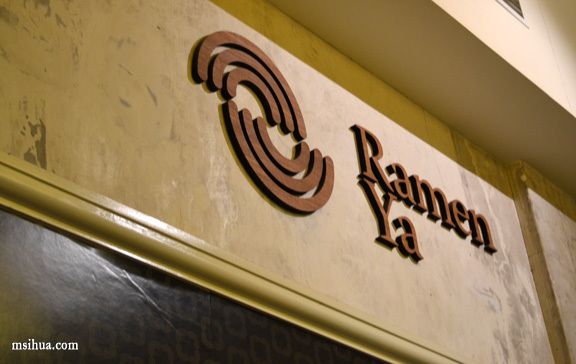 Probably, but I find Ramen Ya has a nice feel to it and hence why, it’s popular with quite a few people. Will it ever be as good as Gumshara Ramen in Sydney? Probably not, but I am still happy to dine here! I’ve followed Billy’s ramen hunt a year later and tried Ramen Ya’s tonkotsu w char su ramen. Yummy! 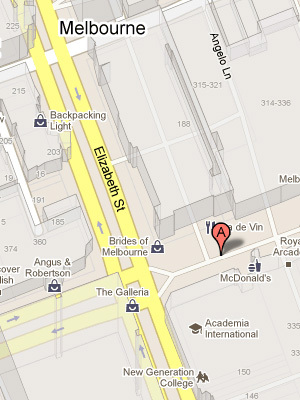 If I’m not wrong, there’s a new one coming soonalong Bourke St closer to Russell. Have to try that! And I shall keep in mind that the soups brothier when the place is quieter & the masterstock isn’t overtaxed. Hahaha! Really?? Must. investigate. right. now! I went back recently – I don’t get there as often anymore since I stopped working in the city – during the lunch hour, and I was a bit disappointed by the broth too. The noodles are still probably my favourite in town though; I haven’t found anywhere else that manages to serve up such springy noodles. But yes, it’s no Gumshara. Or Ryo’s. Hahahaha… yayy and high five! That’s what you should picture every time you go to Karaoke without me. A crying, unhappy, bereft, lonely face. I wonder if they water down the stock when it’s busy to get more servings out of it. Regardless, it looks better than the ramen that I’ve come across here in London. They probably do, which explains the inconsistencies with the broth! Aww… why are you lonelyyyy??!! 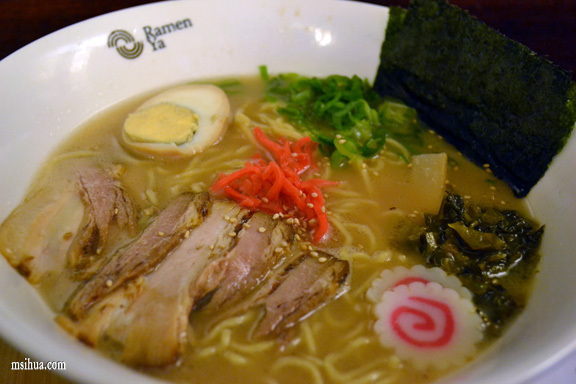 I can do with a big bowl of tonkotsu ramen right now…mmmm…. Hahaha… my tummy’s been talling me to drown in it too! You should.. on a cold day.. it’s beautiful! You are you are you are!!! I have blogger friends, college friends, uni friends, school friends… waaaaaaaaaaa.. you’re all my lovely friends!!!! I just went there two weeks ago! Was quite good. Better than expected. That pork slice melted i my mouth. DELISH!!! !